‘Bristol’ was found in a bag at Bristol Airport in 2012. With him was a photograph, dated 4 March 1918, and written on the back, ‘With dearest love and kisses to our darling Daddie from your loving little daughter and sonnie, Dora and Glyn‘. A large appeal was launched to find his owner and 14 months later he was reunited with him. Now suffering ill health, he decided to find Bristol a new owner, one who would appreciate him and he was offered for sale at auction in Newbury in December 2015. 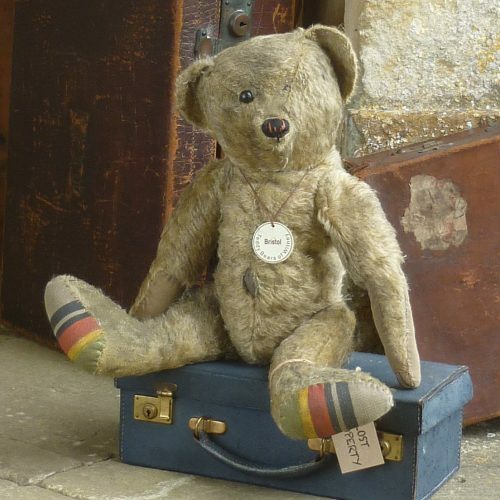 Ian felt that the museum in Witney would provide the perfect home for this unique bear and he now resides here at Teddy Bears. 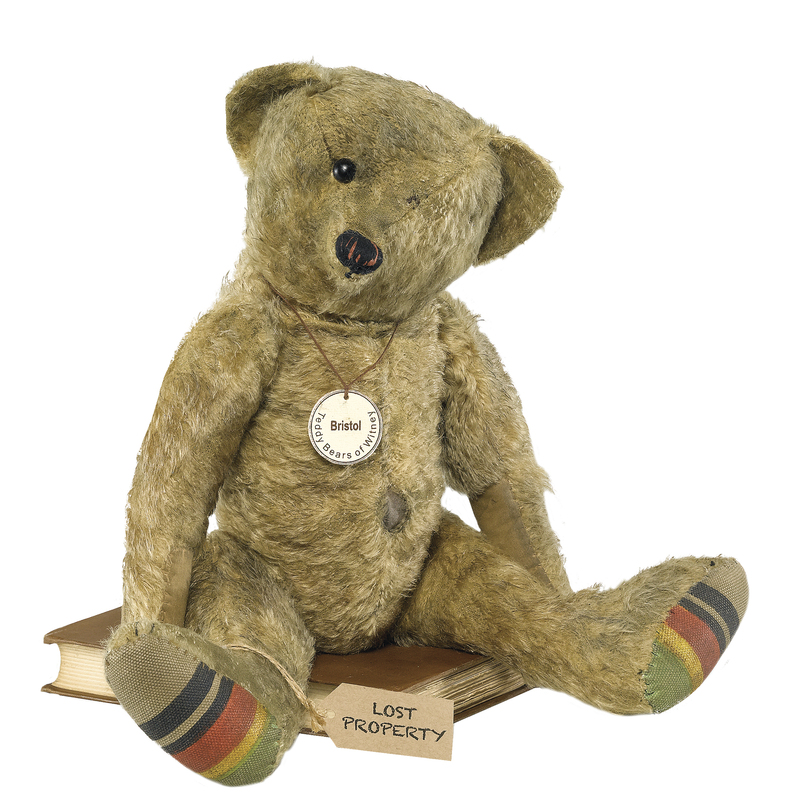 In this sensitively made limited edition, we hope that others will enjoy his special magic, which certain much-loved vintage bears create. Made of aged, old gold mohair, he has one button eye, red felt showing through his ‘worn’ nose, a hole in his tummy (reinforced underneath) and coarse, printed linen foot pads. In addition, Bristol has a partly detached left ear and ‘repaired’ linen hand pads. 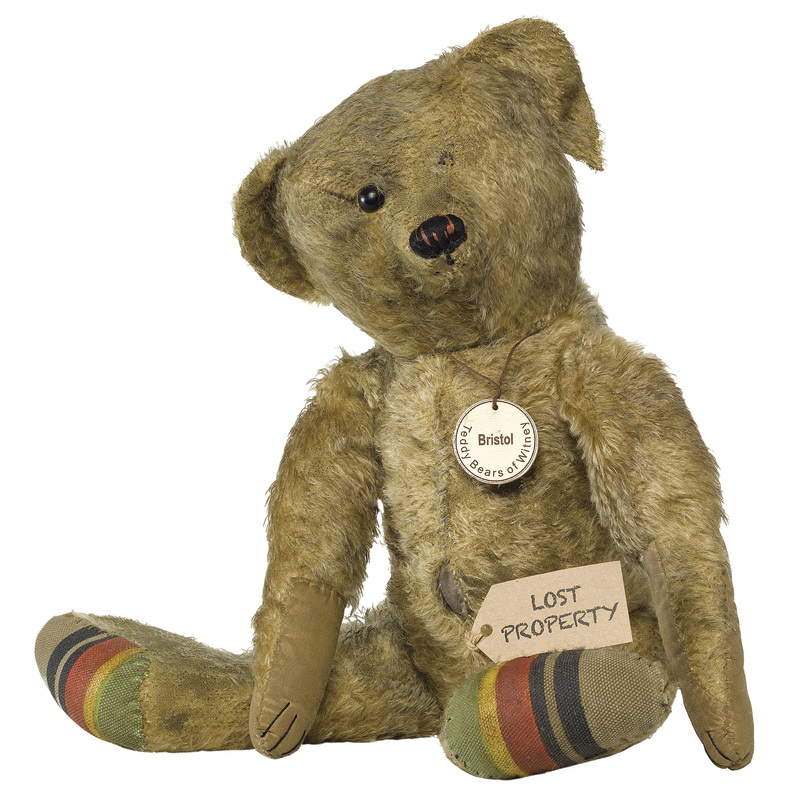 He comes with a Lost Property label and a copy of the 1918 photograph showing the original bear.